Because we require you be dressed in specific fire safe attire, advanced registration is required. Registration closes 6 am Saturday, 10/18/14. 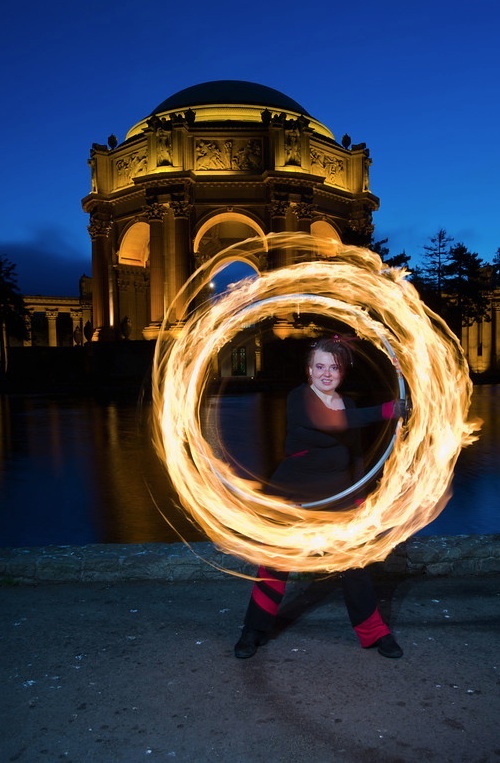 Join us for an evening introduction to fire hooping for those that are new to playing with fire, playing with a fire hoop or those who simply want to deepen their knowledge of fire safety protocols. 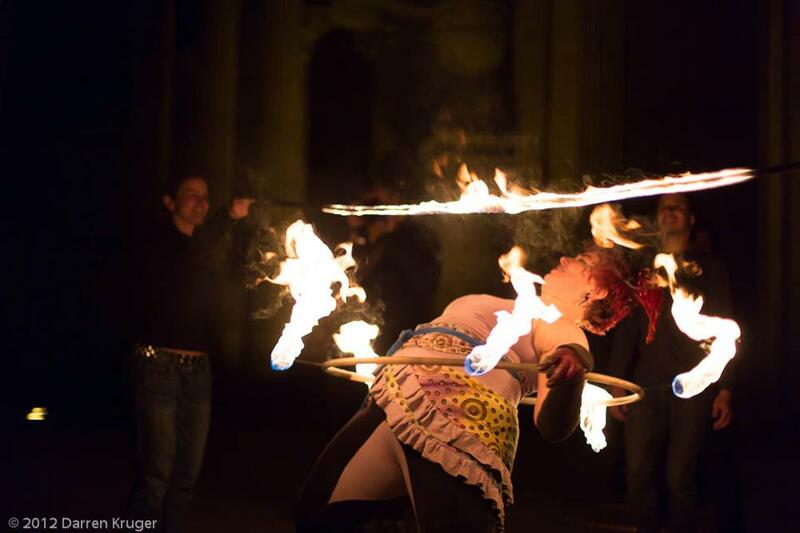 This class condenses the material covered in our regular 3 week Beginner Fire Dancing series and will include information specific to fire hoopers and special considerations for fire hoop artists. The class begins with an 80-90 minute fire safety lecture. The instructor will refer you to written fire safety information which you can download and bring to the class, either on your mobile device or printed out for your reference, thereby allowing you to focus fully in class without needing to take as many notes. Topics covered in this lecture will include: un/safe clothing, fuels, common practices, storing materials, techniques relevant to specific props, running a renegade and practical information of which fire dancers should be aware. This portion of the night is lecture based and will take place at Temple of Poi (953 Mission Street, Suite 11 in the basement). At the end of the lecture, we will have a short bio break and people will then cover themselves up in the appropriate gear for spinning fire, including covering their hair. Students will need to wear fire safe clothing and have hair covered to participate in this class. More details of what you will need can be acquired in the free fire safety manual you can download and if you have any questions, check with GlitterGirl after you register for the class. After everyone is dressed appropriately, we will go out to the street. At this point, we will participate in a series of exercises involving fire and a wick which we will provide where students will get accustomed to the fire, the body response to the fire, how to touch, transfer and extinguish the fire. Every student plus the guests they bring* will extinguish fire at this point. We prefer to have students extinguish the fire 2x each at least to help build confidence in the event that an emergency arises. After we have completed the section introducing everyone to the fire, those with fire tools and those who have made arrangements to borrow a fire tool will be able to spin their tool supervised and coached by us. For everyone’s safety, we will have a minimum number of people spinning fire at a time. Please note, this portion of the course will be taking place on Mint Alley next to the Mint Building. As part of your tuition, students may bring* as many friends, family and fans as they wish to educate to support them in their fire safety procedures. Students are encouraged to bring the people they plan to spin fire around to this class so they can be properly educated. If you have any questions, please contact GlitterGirl directly at glittergirl <at> templeOfPoi <daught> com. Students who will be using a fire prop must demonstrate competence with the fire prop for the duration of a burn (approximately 3 consecutive minutes) either in person or via video to GlitterGirl prior to spinning fire in the class. This is to ensure the artist is comfortable with the tool not on fire before adding the extra element of danger. These classes are empowerment workshops and are transformative experiences. I can’t even tell you how many people walk out of the evening and feel like they experienced something they never thought possible. We want a tight container that is a safe place in which to explore your adrenaline response and the natural fears that fire brings forth. There are zero observers in the class as everyone participates. This class is not intended for the curious, but for the practitioner who wants to have a safe fire experience and wants to understand fire safety, permitting, renegades, fuels, clothing and the risks associated with fire dancing. Fire is a serious element and we work hard to keep track of everyone in the workshop. Having extra people there is work for us. The intent with guests is boyfriends, girlfriends, partners, parents, BFFs and other NON community members who are often our biggest fans and help us stay safe. The “guests” should be people intending to be your fire safety person on a regular basis, not a peer who just wants to learn about fire safety and doesn’t want to pay for the knowledge. If you hoop and you want to fire hoop ever (you think you might, there’s a possibility of it, and/or you’re a member of BAH), you are asked to pay for the class. This is also why there is a sliding scale option so that those who aren’t going to spin the hoop (but will do everything else which is actually far more time consuming) can pay a lower amount. 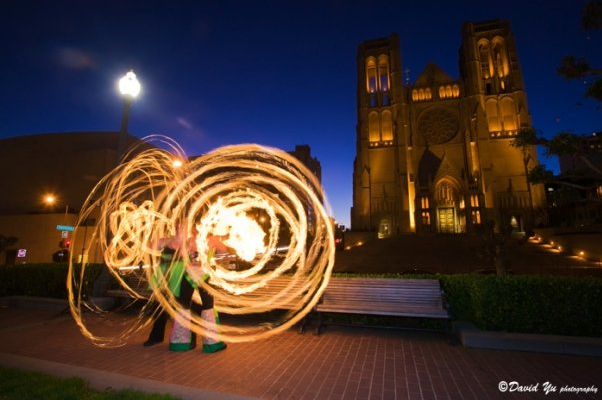 Class meets at Temple of Poi (953 Mission Street, suite 11 in the basement behind the stairs) at 5 PM on October 19, 2014. We will be inside for approximately 90 minutes and then we will go outside. Have some fire safe clothing to keep you warm outside. In the event of rain the day of the event, the event will be postponed to 10/25 at 5 pm. The outdoor portion will convene at the end Mint St. where it intersects Mint Plaza, a block from the Temple itself. The session will end somewhere between 8-9:30, depending on how many students and how many people want to spin fire. Note: You are expected to have your own fire tools in order to fire hoop dance. Hooping in particular is challenging to do with the wrong size hoop. Something too big becomes even larger because the hoop wicks extend 5-7 inches off the side of the hoop, thus making the diameter when doing off body moves considerably larger. Similarly, spinning a hoop that is too small to make up for the extra diameter added by the wicks can be difficult and frustrating to manipulate, which is why we encourage you to acquire removable wick attachments to turn hoop into fire hoop. What we love about quick wicks is that as long as you use the same diameter hoop tubing, you can move them from hoop to hoop as you change size of your hoops. This means as you grown more and more comfortable with the fire and the fire hoop (which undeniably moves differently than a regular hoop without wicks), you will be able to size down with your hoop and not waste the investment of a hoop with fixed fire wicks on them. It is very common for people to want to change diameter by 3-4 inches in the first 6-12 months of fire hooping and the quick wick will allow you to maximize your investment. In addition, we recommend you consider these kevlar sleeves. What we like about these is that if the hoop grazes your forearm, you will feel nothing and will not get burned. 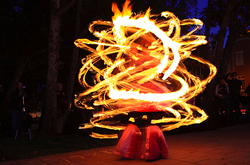 This allows beginners especially to feel fearless and try more tricks with the fire hoop. Although you can’t acquire it from the same vendor, if you plan to fire hoop with regularity, we also strongly suggest you acquire a fire safety blanket to be used by your fire safety spotters who literally watch your back as you spin. Students will also need to acquire fuel and dipping bucket they wish to use for their prop. Each fuel has it’s pros and cons, so inquire with us after you register for our best recommendation for your specific situation. *The fee for the full workshop is $90 – $50 sliding scale, though students bringing other guests to the class to get trained are expected to pay the full price of $80+ for this session. For your convenience, we have included 7 payment buttons below and ask you to pay as much as you can afford. Regular tuition is $90. Note: All deposits are non refundable though they may be transferred to another class at our discretion. ← Learn Poi: Beginner Poi Moves, Mondays – sold out!